Suvereto is a village in the province of Livorno and it’s part of the circuit of the most beautiful villages in Italy. It is known for being home to one of the major wineries and one of the wines that are produced in its lands is the Val di Cornia DOC Suvereto. 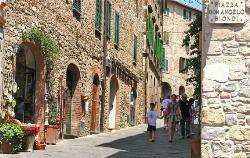 It 's a typical medieval Tuscan village, with its narrow streets, old houses and churches, including the Church of the Santissima Annunziata Del Crocifisso, the Madonna di Sopra Porta. The area around Suvereto is ideal for lovers of outdoor sports such as hiking or cycling, but also for nature lovers in general due to the presence, in the municipality of Suvereto, the Natural Park of Montioni, characterized by a rich fauna and Mediterranean flora. Suvereto is just a few miles away and is a medieval village to be accommodated in the itinerary of visits.